New York (also referred to as "New York City", "NYC", "The Big Apple", or just "the City"), is the biggest city in the United States. It lies at the mouth of the Hudson River in the southernmost part of the state, which is part of the Mid-Atlantic region of the USA. Shopping in New York City exposes you to big department stores like Barneys New York and Bloomingdale's, famous streets like Madison Avenue and to the street vendors on Canal Street. On a New York City shopping experience you will be able to buy anything from souvenirs to couture. When it comes to shopping, New York City truly does offer something for everyone. New York City has a humid continental climate and experiences all four seasons with hot and humid summers (June to September), cool and dry autumns (October to December), cold winters (January to March), and wet springs (April to June). Average highs for January are around 3°C) and average highs for July are about 29°C. However, temperatures in the winter can go down to as low as -18°C (though increasingly rarely); and, in the summer, temperatures can go as high 38°C or slightly higher. The temperature in any season is quite variable and it is not unusual to have a sunny 10°C day in January followed by a snowy -3°C day. New York can also be prone to snowstorms and nor'easters (large storms similar to a tropical storm), which can dump as much as 60cm of snow in 24-48 hours. Tropical storms can also hit New York City in the summer and early fall. Madison Square Garden, often abbreviated as MSG and known colloquially as The Garden, is the name of the arena in the New York City borough of Manhattan, located at 8th Avenue between 31st and 33rd Streets, situated on top of Pennsylvania Station. The arena opened on February 11, 1968, and is the fourth incarnation of the arena in the city. The Metropolitan Museum of Art, known colloquially as The Met, is an art museum located on the eastern edge of Central Park, along what is known as Museum Mile in New York City, United States, North America. It has a permanent collection containing more than two million works of art. Rockefeller Center is a complex of 19 commercial buildings covering 22 acres between 48th and 51st streets in New York City. Built by the Rockefeller family, it is located in the center of Midtown Manhattan, spanning the area between Fifth Avenue and Sixth Avenue. It was declared a National Historic Landmark in 1987. Central Park is an urban park that occupies about 1.2 square miles in the heart of Manhattan in New York City. It is host to approximately twenty-five million visitors each year. Central Park was opened in 1859, completed in 1873 and designated a National Historic Landmark in 1963. The Intrepid Sea-Air-Space Museum is a military and maritime history museum with a collection of museum ships in New York City. The museum showcases the World War II aircraft carrier USS Intrepid, the submarine USS Growler, a Concorde SST and a Lockheed A-12 supersonic reconnaissance plane. Madame Tussauds is a wax museum in London with branches in a number of major cities. It was set up by wax sculptor Marie Tussaud. It was formerly spelled "Madame Tussaud's"", but the apostrophe is no longer used." The United Nations Headquarters is a distinctive complex in New York City, United States, that has served as the official headquarters of the United Nations since its completion in 1950. It is located in the Turtle Bay neighborhood of Manhattan, on spacious grounds overlooking the East River. 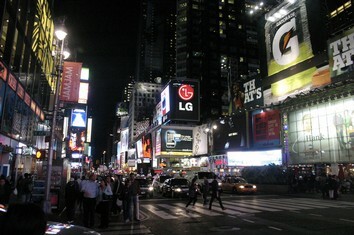 Times Square is a major intersection in Manhattan. Times Square, sometimes known as the "Crossroads of the World,"" has achieved the status of an iconic world landmark and has become a symbol of New York City. Times Square is principally defined by its spectaculars, animated, digital advertisements. " For the many immigrants that flocked from Europe to New York, the Statue of Liberty was the first image they saw of the USA. The statue was a gift from the French government for the 100th birthday of America's Independence. The Empire State Building is a 102-story landmark Art Deco skyscraper in New York City. Its name is derived from the nickname for the state of New York, The Empire State. It stood as the world's tallest building for more than forty years, from its completion in 1931 until construction of the World Trade Center's North Tower was completed in 1972.